Jackie is a truly gifted singer that can sing as pure as Ann Wilson of Heart, then tear it up with a killer rendition of Bon Scott of AC/DC. Her powerful style really helps set Revolver apart. Jackie believes in entertaining the audience, and is a natural showman (or should that be show woman)? 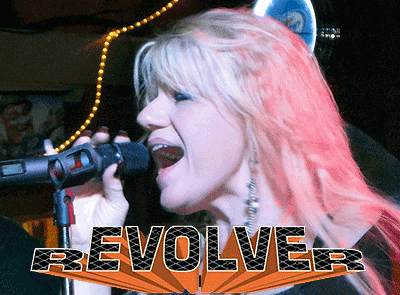 Jackie has played in Baltimore bands for the last 20 years, including Scarlet Angel, and Shooter. John is a founding member of Revolver that is still with the band these many years later. John is the band's strong foundation. Along with Wayne, he gives Revolver the rhythm section that drives the band. John also sings backing vocals and the occasional lead. He has even been known to break out the harmonica and come out front. Just another dimension for Revolver. Ed is one of Revolver's stellar guitarists. Music is his passion, and it shows in his playing. Growing up in South Baltimore (Locust Point) he honed his craft by listening to artists such as Styx, Kansas, Queen, Yes, Steely Dan, Journey, Pat Travers, Iron Maiden, and many others from the 70s and 80s. He is also capable of singing high notes that have been known to make dogs howl. He is another part of the vocal harmonies that sets Revolver apart from other bands. The addition of Jeff to the Revolver line up represents an exciting new aspect as we now have two exceptional guitarists. This creates a fuller sound that we are really excited about. Plus it opens a lot of doors to new material that we know the Revolver fans will love. Jeff will also be sharing the lead vocals duty. Tim is the keyboard player and other founding member of Revolver. Along with his talent for playing keys since he was 5 years old Tim also brings his perfect pitch ear to the band. During the day you can find Tim on the streets delivering the mail for the good folks of Hanover, Pa.
Wayne is a founding member of Revolver. Starting the band in 1980, Wayne's vision was to create a band that replicated the songs they played as close as possible to the record. That quest has not changed. As the de facto leader of Revolver (that means he does all of the stuff that nobody else wants to do), Wayne's bass playing gives Revolver its rock solid bottom. He is also Revolver's resident Ric Ocasek (The Cars) sound alike. We are still trying to determine if this is a good thing or not.